Robert Cruickshank has a response to my earlier post on how to handle student debt that you should check out. My plan was bankruptcy reform and mass refinancing, while Cruickshank thinks those trying to deal with current student loans need to deal with the principal itself, as it is far too high (“The best solution is to simply forgive all existing student loan debt”). My initial thoughts stand: the core problems of student loan debt as I read them can be tackled with those two steps. If the monthly payment is too high, low-interest refinancing will bring it down. If the lifetime payments are too high, same. If the balance is too high without any interest, bankruptcy process is in play. Low-interest refinancing acts as de facto principal reduction. Also my read is that student debt as a whole isn’t holding back the recovery, and $1 trillion dollars can be spent on better stimulative things now and merit goods later. That said, lower student loan debt is a good thing. My first thought is to check distributional impacts. There’s an assumption you hear in the media that college loans problems are an upper-middle-class, things-white-people-like type of problem. How well does that play out? Let’s get some data going. This is debt for the graduating class of 2008. 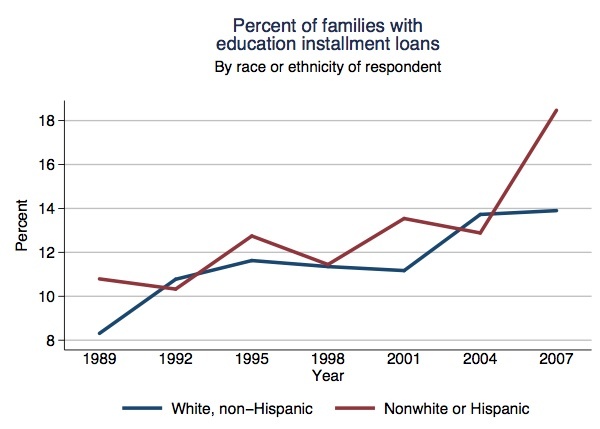 African Americans are most likely to borrow and graduate with more debt. Two-thirds of all students graduate with debt, and those that do have a lot of it, which is a giant sea-change within a generation. A weak labor force is even more likely to cause widespread youth discontentment under these circumstances. How does this break down on distributional lines? 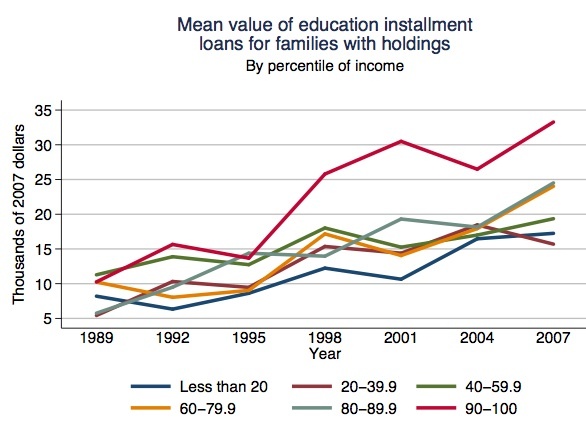 People in the middle of the income distribution, 40%-90%, are the most likely to have a student loans. 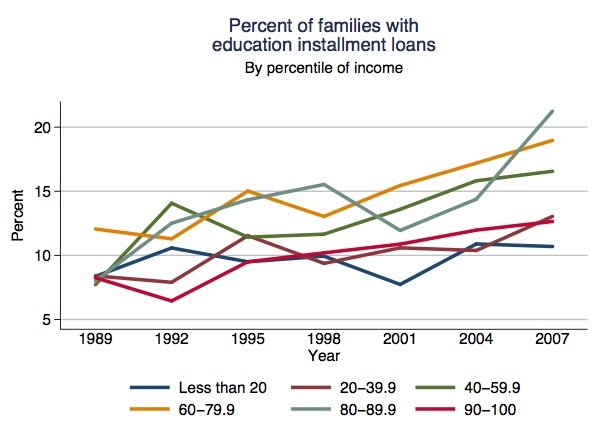 Those in the top 10% (and presumably especially in the top 1%) are less likely to have a student loan. Those in the bottom 40% are also less likely, presumably for a host of reasons starting with the idea that they are less likely to have finished high school. That doesn’t surprise me. What is interesting is how tight the span of average loan balances for those with loans are for the 0-80%. 60-90% isn’t that much higher than 0-60% in actual balance. We are talking the difference between $24,000 and $18,000 in student loan debt – which is shocking given how much incomes drop off under the $60,000 percentile. My initial read is that everyone who takes on debt to fully educate themselves take on nearly the same amount debts. Then they roll the dice in the American economy – it works for some, and the debts are manageable. Less so for others. What other questions need to be answered in the data as we go further into it? This could be because of more access to college for the minority population, no? Or is it a percentage of college attendees? If it’s the first, I think the case could be made that it’s a good thing. This (http://www.usatoday.com/news/education/2006-10-29-minority-enrollment_x.htm) says ‘Minority enrollments rose by 50.7% to 4.7 million between 1993 and 2003, while the number of white students increased 3.4%, to 10.5 million, the report says.’ Eyeballing the graph suggests 11% -> 19%, which is inline with a 50% increase in enrollment, unless I’m super confused. I don’t know the answer one way or another, but is the increase in minority enrollment is largely in for profit colleges? In some ways wouldn’t that make the increase in enrollment of minorities a parallel to the increase in home ownership among minorities during the housing boom? That’s a possibility for sure. There’s no way of normalizing the quality of the education based on the data presented here. The home ownership parallel is a good one, too, I suspect. Probably should look at the default rates, which I think MikeK has done. How does the income percentile by age data look? As in, how do loan balances, percentages, etc. compare for those in the Xth percentile of income at age 30 compare? I was lucky to graduate debt free, but my wife had some debt upon graduation. We were about median upon graduation, but are easily 95th percentile or so now. Similarly, my sister-in-law just graduated from dental school with roughly $250k in debt and earnings about median, but within a few years she’ll likely be much higher up the income distribution. That didn’t stop us with ending slavery as a legal instituion, even though someone had to be the last slave. It shouldn’t present a barrier now. MikeG, I think the answer is a bit more complicated here. When I was an undergraduate, and even when I was getting my first Masters I was able to use savings, some grant money/scholarships and very, very small loans to pay for all of it. I worked while going to school too and never took more than I needed to pay any bills. My choice of school was also limited to the set of institution what my parents and I could comfortably pay for and in both high school and the college admissions process this affordability was discussed. In fact, I never took out a loan for my first Masters at all. Now flash forward to today. No one talks about affordability any more, parents are pushing their kids into what they perceive as “top” schools…probably by how much they cost and not by reading the stats on their outcomes. I teach part-time at the college level and have since I was in grad school. I am a C-level guy, and going to state schools for my first two degrees didn’t hurt me one bit. No one ever asked me much of anything about the degrees, they just wanted to check to see that I had them. The idea that “certain” schools confer success is just absolutely false and ludicrous, although it is great marketing. I personally know lots of people that went to top-tier schools and aren’t doing any better than anyone else, and people who went to community and then a state school and are doing fabulously well. Talent is talent. So the real problem here is that banks are (once again) writing loans to anyone with a pulse, and no one is counseling anyone about what the loans mean when one graduates, and the percentages the payments will take up of those average salaries. And parents are also 90% of the problem here from my vantage point of being a prof because they don’t frankly talk to their kids about this. But regardless, if you thought housing was a bubble, wait until the full impact of this hits. Not only is it going to hit the former students, but schools will close en masse, believe me. 1. What comparison is there between debt burdens when those age cohorts in the % of families graph (the first line graph) were all the same age. That is, someone who is 65 would just mechanically have less of a debt burden than someone who is 25 because they have been paying it off for 40 years. 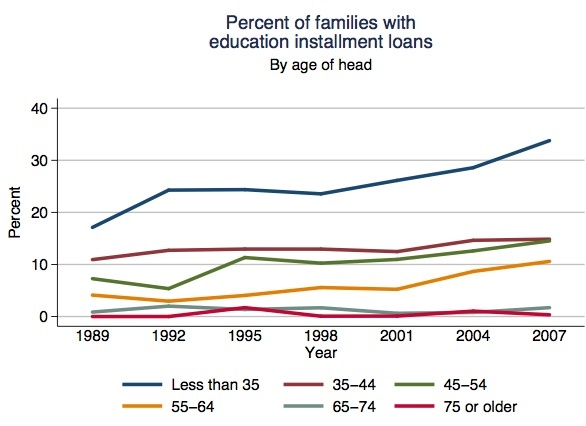 What kind of debt burdens did baby boomers graduate with? 2. I think the much higher debt burden of the top 10% is interesting because it obviously reflects the increased need for professional degrees to gain entry into that level of income (and rent seeking all the way up the chain). 3. While debt levels seem basically the same across percentiles I think that glosses over a couple of things. First, whats the “value” of that debt. Someone with $20k in debt with a BA from a liberal arts college is significantly better off that someone with $20k for a year at Phoenix University. However, you seem to be suggesting that that last graph is for people with “full educations”. There is still a value question, but I wonder if that graph suggests that there is less price discrimination in high ed that I thought, or at least that it plays out differently that I though. Btw, dude, next time you encourage discussion about a bunch of graphs you should label them. I think you mean twice, not half.